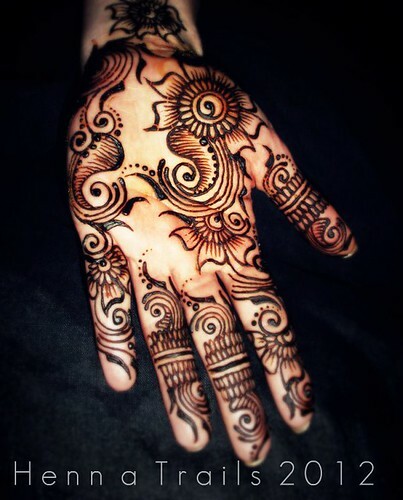 floral henna palm 2012, a photo by Henna Trails on Flickr. Well, it is winter and the tops of my hands spend nearly all day covered in olive oil. Olive oil is good for henna stains, less so for henna paste. This design was inspired by a video from Ash Kumar that I have been studying. I am drawn to his design work because it has so much movement. My clients tend to prefer the more Arabic styled mehndi, I have never had the opportunity to do traditional Indian bridal mehndi, so I go with what my current clientele likes…open flowing designs, also my personal favorite style. I wear henna for no other reason than as a natural beautification style. My henna paste is made with 100% organic Rajasthani henna powder, tea, cajeput essential oil and sugars. I love the fact that henna is from a plant and has been used for thousands of years. Thousands. Love henna.